Plain Text. Michael Vince. Paperback ISBN 978-1-869848-03-3. £7. 9 March 2015. Michael Vince, born in 1947, taught in Italy and Greece, where he lived and worked for many years. He now lives in London. The poet of The Orchard Well , (Carcanet), In The New District, (Carcanet), Mountain, Epic, Dream, (Bran’s Head) and of the pamphlet Gaining Definition, winner of the Eric Gregory award, his poems have appeared in magazines in the UK and the US over the past forty years or more. He has a web site: www.michaelvince.co.uk. 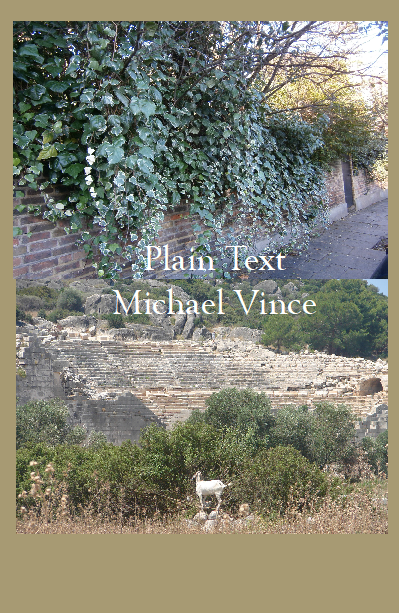 The poems in Plain Text link a London world of past and present, perceived through social and historical myth, with the timeless ancient world of the Greek historian Herodotus. From these worlds emerge exemplary figures, who may be living in the house next door, or in worlds of imaginative representation, in books, pictures or documents. The poems feel their way into the environments of present and past, personal and public. The purpose may be to make things ‘plain’, but plainness turns out to be complex, haunting the everyday with histories forgotten or ignored. ‘Vince’s music is quiet and unassertive, yet always persuasive, its rhythms constrained but buoying the lines to move both the reader and the trajectory of the poem’ - Ian Pople, The North.